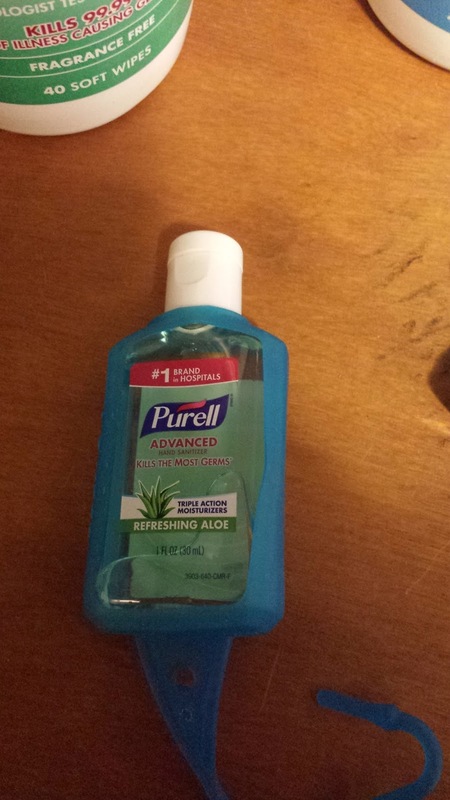 ♥ Mama 2 Multiples ♥: Purell Bundle Review from Shoplet! With four little ones in public school and daycare, and a busy working mama and step father, it's crucial that we all stay as germ free as possible to avoid any sicknesses we can so as not to miss school or work. Some would call me a hand sanitizer freak....but I can't help myself! I use it ALL the time, and have dozens of bottles of various hand sanitizers kicking around in random places at all times. 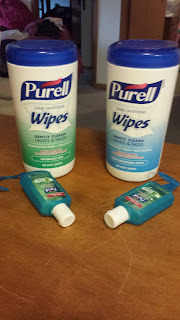 When I was approached by Shoplet and asked if I would be interested in a review of their Purell bundle of products they offer, I instantly said yes! From Shoplet: "Shoplet is the number 1 e-tailer of business and office supplies. We carry an assortment of office supplies, cleaning supplies, medical supplies, and everything in between." 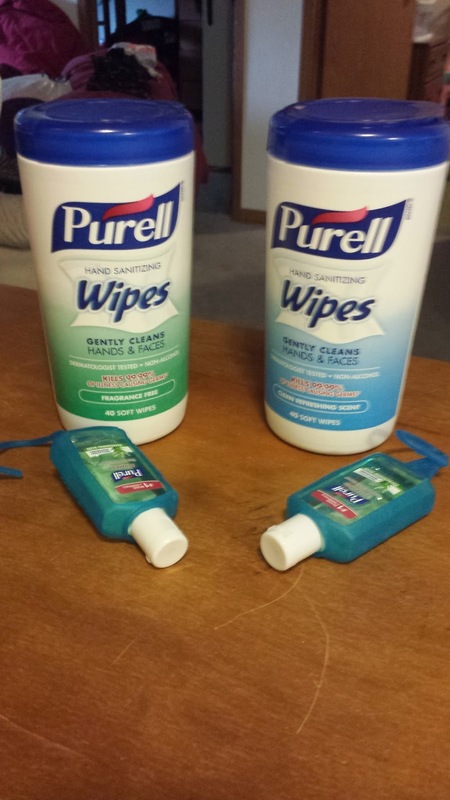 For my review, I received two canisters of Purell hand and face disinfecting wipes, 4 small hand sanitizers and holders, and 2 8 oz. pump bottles of Purell hand sanitizer (not pictured). The small hand sanitizers are SO handy! 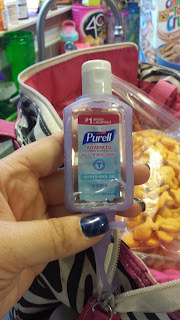 I have one on my purse, one on our diaper bag, and one on my set of keys, so I have hand sanitizer no matter where I go! The hand pump sanitizers aren't pictured in this review because each are being used. I keep one in my van, and Jeff wanted to keep one in his work truck. As a satellite television technician, he goes into some questionable and -- let's face it -- downright disgusting homes or areas. It's no surprise he needs and WANTS to stay germ free after some of the dirty jobs he runs into from time to time! 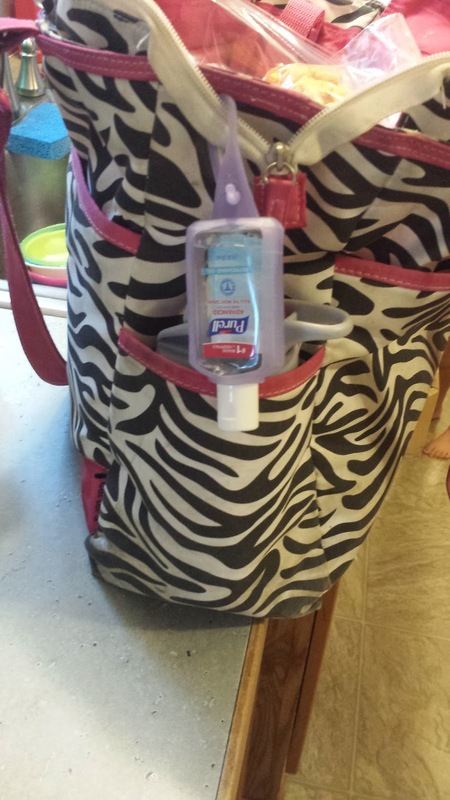 Keeping this bottle in his work truck allows easy access to germ free on the go hand washing. Even though I carry a mini hand sanitizer almost everywhere I go, I still like the idea of having a bottle in my van at all times, especially when I spend so much time there with my work and getting the kiddos here, there, and everywhere! The Purell hand and face disinfecting wipes are awesome. I am a big fan of Lysol disinfecting wipes for our counter tops and table and other surfaces at home, but until now have just used baby wipes to clean the kiddos hands and faces after meals. I LOVE these wipes! They are SO soft and gentle on their little skin, and clean very, very well, leaving happy babies and a happy mama! I would definitely continue buying these products after trying them out first hand in this way, and would look to Shoplet for this need, as well as many other various supplies I may need in the future! **DISCLAIMER** I received the above product(s) from Shoplet free of charge in exchange for an honest review. No other compensation was received. However, all opinions are strictly my own. I too do not prefer drinking packaged juices and mostly rely on freshly made natural juices. However, some high quality packaged juices are not bad sometimes.